Once upon a time, in a far off world otherwise known as THE BIG APPLE, lived a girl filled with so much imagination she didn't know what to do with herself. She felt that if she didn't figure out what to do with it, she would just burst into tiny little pieces. In trying to work on an idea, she came to realize that she enjoyed observing all the different faces among her. She found herself, when on the subway or any other crowded place, looking at the variety of shapes and colors and expressions of these faces, along with their colorful, stylish (and sometimes NOT so stylish) clothing . All beautiful, all unique. 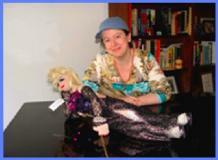 It was then that she knew what she wanted to do to satisfy her creativity - she would make dolls. Cloth dolls at first then onto needle felted dolls -representing all of the beautiful, unique faces, In time she started making little animals as well, because she was also a big animal lover. Soon she was surrounded by so many of these whimsical characters. She loved them all, but felt selfish holding onto them. "What good is all this creation if it's not to be shared?" She then decided to share them through the internet so that others may adopt and love them as she did.